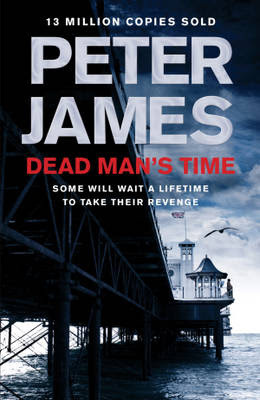 DEAD MAN'S TIME is the ninth in the series of Detective Superintendent Roy Grace novels by Peter James. In 1922 New York, 5-year old Gavin Daly and his 7-year old sister Aileen board the SS Mauritania to Dublin and safety - their mother has been shot and their Irish mobster father is missing. A messenger hands Gavin a piece of paper and his father's pocket watch - on the paper are written four names and eleven numbers, a cryptic message that haunts him then and for the rest of his life. As the ship sails, Gavin watches Manhattan fade into the dusk and makes a promise that he will return one day and find his father. In Brighton in 2012, Detective Superintendent Roy Grace investigates a savage burglary where an old lady has been murdered and ten-million-pounds worth of antiques taken including a rare vintage watch. To his surprise, the antiques are unimportant to her family who care only about the watch. As his investigation continues he realizes he has stirred up a mixture of new and ancient hatreds with one man at its heart, Gavin Daly, the dead woman’s 95-year-old brother. He has a score to settle and a promise to keep which lead to a murderous trail linking the antiques world of Brighton, the Costa del Crime fraternity of Spain’s Marbella, and New York. Again, Peter James produces crime fiction for those who like to have well-rounded detectives with a believable private life. The short snappy chapters are still there (126 chapters in 416 pages) but so is the slight hint of unrealism in the significant figure from his past and this is dragging on far too much and it really is the case now that you will appreciate this book much more if you read the series in sequence. The other issue with this book for me is that the ending did seem rather too reliant upon coincidence to tie up the loose ends rather the intervention of Grace and his team. Read another review of DEAD MAN'S TIME.